My Love for Aldi beauty continues and to be fair I have not yet found a product that I don't like. 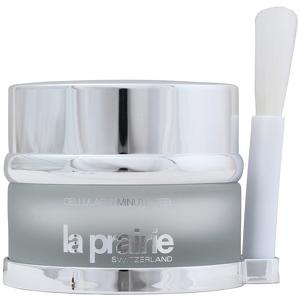 Aldi Lacura Caviar Illumination 3 Minute Cell Renewal Peel Mask is Aldi's version of La Prairie Cellular 3 Minute Peel Mask at the ripe old price of £153.00 I have looked at the ingredients on both of these products and to be perfectly honest there is not much difference between the two, but I would expect for the price La Prairie would contain higher values of the ingredients, I have not tried La Prairie ( no shock there ) so cannot do a comparison on usage. At £6.99 this mask is unbelievable value for something that is totally brilliant, if you have sensitive skin I do recommend that you do a patch test of the mask as it is no lightweight product, this is serious skincare even though it is as cheap as chips. 3 minutes needs to be the maximum time you would keep this on, it will literally eat away dead skin cells leaving your skin soft, fresh and brighter looking, paint the mask onto damp skin with the brush included, avoid eye and lip area's leave for max 3 minutes and remove with warm water and a cloth, this is lovely to apply it is almost like painting moisturising cream onto your skin, it isn't at all runny or drippy and stays in place until you are ready to remove it. Once or twice a week is all that is needed. I have tested a few exfoliation masks recently and have to say this is one of the very best at a crazy bargain price. Whenever I do an Aldi review I get lots of messages saying that the products are a nightmare to get hold of, this problem is now solved by Aldi being online and with FREE delivery. Do you Love Aldi as much as me ?